June 2017 was a pretty big month for the nbn co. So big, in fact, it saw over 525,000 premises across Australia becoming ready to connect to the NBN™, making it the biggest rollout yet! The rollout is now officially past the halfway mark which means one in two Aussies you meet are now able to connect to the NBN™ network. That’s over 10.5 million premises that are either connected or ready to get connected to the future of Australian broadband. With that milestone done and dusted, the rollout of the NBN™ network is scheduled to be three-quarters complete by the middle of next year, and all wrapped up by 2020. Reaching the halfway mark means that 63,000 km of fibre cable has now been laid, 2 satellites have been sent up into space, 1,700 fixed wireless sites have been built, and 21,000 nodes have been installed. That’s pretty impressive! To date, the iiNet Group has connected over 250,000 NBN™ customers who, according to two major nationwide surveys, are the most satisfied NBN™ customers in Australia. Our experience has shaped us into the NBN™ experts and it showed with iiNet coming out on top and receiving high scores in both surveys for reliable connection, connection speed, value for money, technical support, customer support, bill clarity, and ease of setup. You can check out all the details from the surveys here and here. On top of this, you’ll get the flexibility of no lock-in contract, value for money and a 24/7 technical support team. Any time of the day or night: if you need us, we’ll be there! 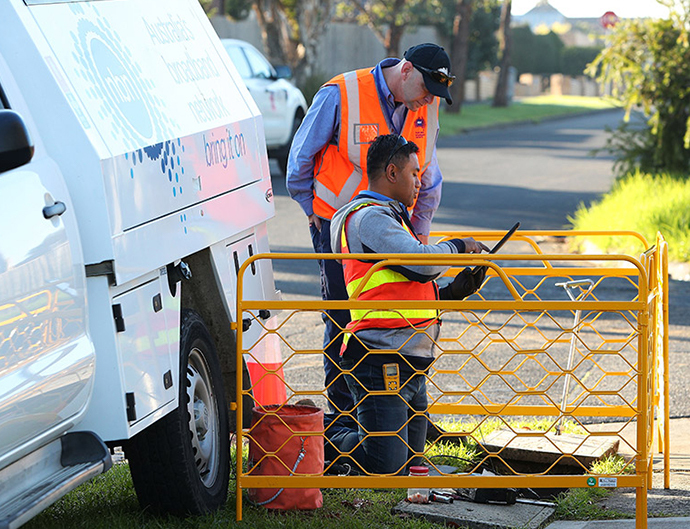 If you can’t wait to get connected to the NBN™ but you’re not sure when it will reach your door, head on over to our NBN™ Coverage Checker and enter your address. The results will tell you which connection type you can expect and what stage of construction has been reached in your area. Your ideal NBN™ plan is only a click away! *Min charge incl $79.95 setup fee + $99 hardware cost (HFC only). Available in selected coverage areas. Have been with Iinet for as long as I can remember, and your new NBN plans are more expensive than Optus and Tpg. Why should I stay with Iinet if my loyalty means nothing to you? Hello Con, we believe that our NBN plans (https://www.iinet.net.au/internet-products/broadband/nbn/) represent excellent value when you consider our award winning level of customer service. We appreciate the loyalty of all of our customers and as such provide the same high value plans to all of our customers, new and tenured alike. Hi Noel, some areas already using high-speed cable technology may not need to switch to a different Internet type as the NBN will instead hook into the existing infrastructure. This is not true for all areas, however, so it would be a good idea to confirm if this is the case by checking out the Coverage Map for your area which will advise which NBN technology your area will be serviced with. I have ADSL. I live three kilometres from the town exchange. Speeds are ok for what I do. Will NBN be as good? I hear that it is expensive and unreliable, prone to crashes at peak times. Also I am not happy being rated a second-class citizens with the future ‘service’ I get, that is, first-class and equal under Labor, second-class under Lib-Nat Party Government. Be assured that if the future ‘service’ stinks, I will let you know and the local Nationals MP will cop a serve. If there is organised protest at the next election, I might join it. We’re sorry to hear you are regretting the switch. If you’re experiencing difficulties or have questions surrounding the new NBN service, we have a Support team (13 22 58) available 24/7 if you need a hand. I am very disappointed I still have no nbn. I would prefer fives but have been advised I will now get wireless. That was suppose to be installed last year. Now I don’t know and it is hard to find out. Sorry to hear that you feel this way. Ultimately, all providers pay to access the NBN network and we do need to recover the costs we incur for setting up connections. Hi my name is roy gorry.i am on your list not to be connected to nbn,why you ask,well it is so simple,how can you say i will be on nbn ,no chance as we do not have cable to our house and will not get it,we will still be on telstra lines as being in collinsville 4804 it was too expensive to put cable on ,or into our boxes out side the house as we can only get nbn if telstra connect us ,but it will only be the phone,not on my computer,i wanted a node to the house,but no can do,that is why i was advised not to connect till i am made to. Hi, When is the planned installation going to happen at 6 Nicholls Cres,Burton S.A 5110? You area is due to be moved to Fibre To The Node, with NBN indicating April to June 2018 as being the potential availability. Before I die, I do not want Turnbull’s FTTN. I want fibre direct into my home as promised so long ago. Will I be forced to change to NBN when it comes to my street next year. I already achieve over 13-18Mbps on a $50/month ADSL2 unlimited data plan, and I don’t really need it any faster, I can already stream 3 netflix streams simultaneously. Will I have to pay more for the same result? You’ll eventually need to move to the NBN, but you’ll have up to 18 months from the time NBN services are first activated in your area. this will be plenty of time for you to weigh up your needs, versus what will be available to you, as services are likely to improve in that time. I can’t understand why some people have NBN boxes attached to there house, and I run off FTTN and copper cables. Is this the cheap option, and are some of us being ripped off????? Great question! NBN had modified their rollout plan from a Fibre/Wireless/Satellite model to a Multi-Technology Mix model as governments and their policies changed. Therefore, some premises have NBN external boxes attached in preparation for Fibre To The Premises services and others don’t, being subsequently being moved to Fibre To The Node. NBN want to connect 200 homes to the Node, will this give any active service at all? We don’t offer a radio connection, but if NBN Wireless is an option, we’d offer that. With regards to connecting to the Node, it does depend on a multitude of factors, but the service will be able to be used. I have entry-level NBN fibre to the node at our city home (my workplace), and helped an elderly friend in the country convert to NBN wireless through an iiNet subsidiary. The FTTN connection download speed is above 80% the entry-level maximum for most of the day, but decreases as schoolkids and workers come home in the evenings. It’s a pain to have to pay for fibrephone when we don’t use it, but I suppose my extra money is supporting iiNet’s excellent support services. Overall data speeds are about three times what they were with ADSL2+. An occasional modem/router power cycle keeps things up to speed. In the case of my friend’s country NBN wireless the data rate is about twice the speed compared with the previous mobile telephone dongle data service. her fibrephone service is much clearer and less crackly that the previous POTS service. Overall, her total bill has reduced a fair bit. Over the year the service has been in place it needed about 2 wireless receiver power cycles and about 5 modem/router power cycles, problems possible due to the quality of the rural electricity supply. The root of Australia’s data provision problem is the government’s sale of Telstra; if my memory is not failing me, instigated by Labor. NZ never sold their government telco, so has a reasonably-priced superior network.